The National Speech and Debate Association has released the resolutions debaters nationwide will be using this summer at the 2015 National Tournament, held in June in Dallas, Texas. Please feel free to use and share this graphic! 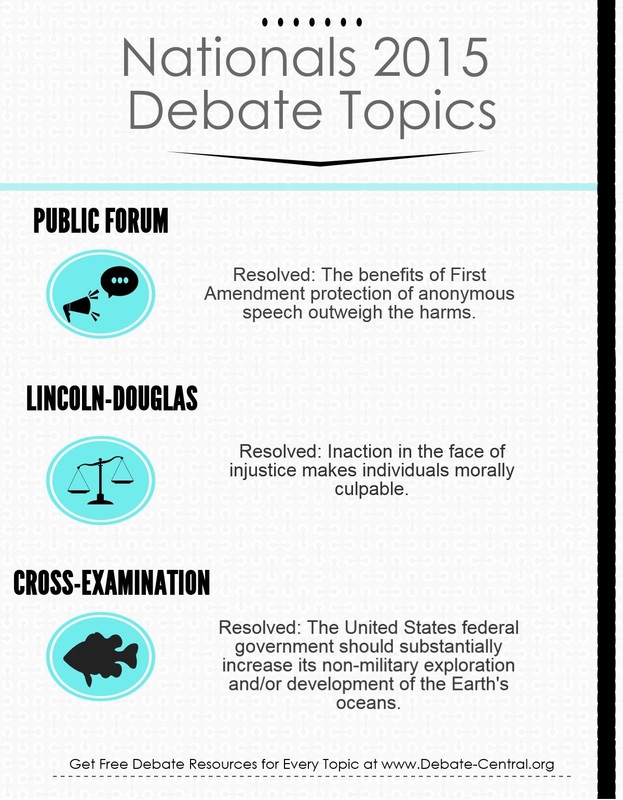 Public Forum- Resolved: The benefits of First Amendment protection of anonymous speech outweigh the harms. Lincoln-Douglas- Resolved: Inaction in the face of injustice makes individuals morally culpable. Cross-Examination/Policy- Resolved: The United States federal government should substantially increase its non-military exploration and/or development of the Earth’s oceans. Debate Central will be releasing our topic guides for the new PF and LD resolutions within the next few days, so be sure to check back! CXers, don’t forget to check out our many resources for the policy topic, as well! 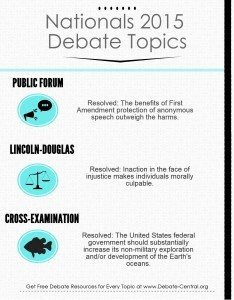 What do you think of these topics? Are you excited to debate them? Tell us in the comments! when will the public forum topic guide be published? I am working on it right now, and hope to have it out before the end of the week– maybe even in the next day or so. The LD guide should be out a few days after that. Thanks for using Debate Central! The PF topic guide is available here: http://goo.gl/jDHUrV & the LD guide will be out later this week! Is the topic guide coming out soon? Will the evidence file be up for LD? Thank you! Absolutely! The LD Nationals topic guide will be released later this week. I’m working on it now!